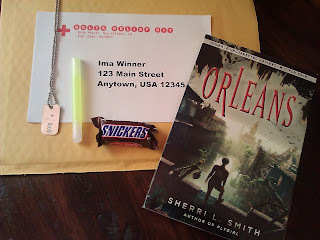 I am happy to host Sherri on the blog today to chat about some good 'ole fashion ways to survive an apocalyptic hurricane! 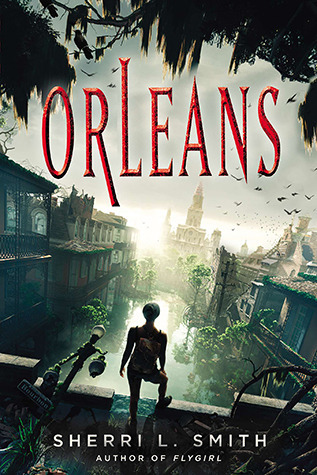 First, let's find out more about ORLEANS and stay tuned for a giveaway. Kirkus calls it "A harrowing and memorable ride." In Land O’ Quakes Los Angeles, where I live, they teach you to have at least three days of food, water, clothes and medicine in the event of a disaster. (A friend made me take a “Living on the Fault Line” class when I moved here.) The common wisdom being that emergency services can reach most people within three days. I think some of the recent storms have shown five to seven days is a better estimate, and even then, you might need to stretch it. Everyone should have two go-bags - one in your car, one tied to the leg of your bed. Inside should be a change of clothes, good shoes (boots, sneakers, something to keep you from walking on glass), food, water, any prescription meds you might need, a flashlight and a battery operated radio for starters. A first aid kit and a roll of toilet paper are useful, too. Backpacks are easy to carry. Then come up with a rendezvous point for you and your family. If there are no phones and you are not all at home, where do you meet? Take a weekend to think it all through. For more information, check out the Red Cross, the Federal Emergency Management Agency (FEMA) or your local Community Emergency Response Team (CERT) website for lists on how to prepare your household and your community. Even in catastrophic circumstances, something is better than nothing! This isn’t always possible. It requires transportation, money for fuel, and somewhere to go. Make that part of your preparedness plan. Many coastal areas have posted evacuation routes—look for the blue sign with the little hurricane sigil (or tsunami, or volcano!) and an arrow pointing the way. Learn your route. If you don’t have your own vehicle, talk to a neighbor or, see what your town offers that might help. We all remember the bus loads of people being evacuated from New Orleans during Katrina. What can you do to make the trip easier on yourself and your family? Back in 2004 my husband and I planned a vacation with friends to Florida. We rented a house on a strip of beach in Pensacola and were amused to see in the photos that a dome house had been built on the same strand. The house was purported to be “hurricane proof”— solid concrete in an aerodynamic shape, windows that could withstand 300-mile-an-hour winds, and a front staircase designed to break away in a storm. It was very James Bond and kind of funny. And then, a month before our vacation, Hurricane Ivan hit. Category 3 at landfall, it devastated that strip of beach. When the weather cleared, the house we had rented was a pile of matchsticks. The only house left standing intact was the hurricane dome house. The owner rode out the storm with a reporter—you can read about it here. That crazy design actually worked! Why doesn’t everyone have a house like this? Apparently, it’s too expensive. But it’s got to be cheaper than rebuilding every few years! One of the books I read for research, Good Pirates of the Forgotten Bayous: Fighting to Save a Way of Life in the Wake of Hurricane Katrina by Ken Wells. It recounts the ordeals faced by several different families and individuals living on the fringes of the Gulf south of New Orleans. When faced with a storm that washed away both his and his neighbor’s houses (both raised on stilts to avoid a normal storm surge), one fellow clung to a treetop and spent the night with a bunch of wild animals also holding on for dear life. It sounds insane, but he survived. You can’t plan on luck, but you sure can hope for it. So, on that note, to each of you: Good luck! One lucky winner will receive a Delta Relief Kit, complete with a signed ARC of ORLEANS, a blood type ID dog tag, a glow stick, and the ever-crucial Snickers bar - everything you need to navigate ORLEANS, at least from the comfort of your armchair! Fill our the fancy doo-hickey below to be officially entered. US only, good luck!